The panto in the British parliament may be providing some Irish schadenfreude, but if Britain crashes out of the EU with no deal, the laughs will be short lived. If the Brits go down, they’re taking us with them. Watching the chaos unfolding in the UK over the past week, I was reminded of the dying days of the last Fianna Fáil government and its desperate efforts to keep the show on the road. The beginning of end for that administration came when a succession of Fianna Fáil ministers were sent out, Comical Ali style, to insist Ireland wasn’t getting a bailout – even as the Troika was in town. On Monday morning, we saw a similarly unedifying spectacle when senior Tory MPs assured the British media the vote on Theresa May’s Brexit deal was definitely going ahead. Asked by the BBC’s ‘Today’ programme at 8am if the vote was “definitely, 100pc” going to take place, Environment Secretary Michael Gove was resolute. “Yes, the vote is going ahead,” he replied. He wasn’t the only one who was a made a fool of. MPs were instructed to do those interviews, despite reports in the British media yesterday suggesting Mrs May had informed EU officials on Sunday the vote was being abandoned. Members of a government may be content to occasionally dissemble to pull the wool over voters’ eyes. But, they don’t appreciate it when they are the ones being lied to and their prime minister uses them as unwitting media cannon fodder in an effort to buy some time. It is clear Mrs May and her government are on their last legs. Already grievously wounded, and devoid of any power or authority, her assurances are not worth the paper they’re written on. Having denied parliament its say on her deal, Mrs May has instead jetted off to meet European leaders on her latest mission impossible. She lands in Dublin today for talks with the Taoiseach in a bid to rescue her Brexit deal. Mrs May wants the EU to come up with some magical form of words that will enable her to sell her deal to the motley crew of remainers, rebels, malcontents and fantasists in the House of Commons. But, there is no clarifying statement the EU can provide that will turn the backstop arrangement into something that it’s not – a temporary measure that can be revoked unilaterally whenever the British want to. In deferring yesterday’s vote, Mrs May has just postponed the inevitable rejection of her deal. 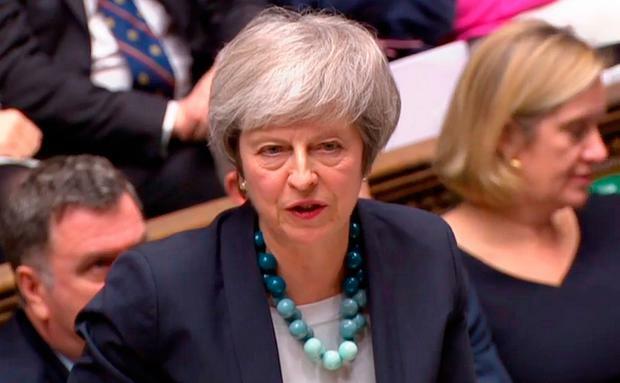 She may have bought her government some time, but at some significant cost – the opportunity to allow her country either to hold a second referendum or plan for a disorderly exit. Once Mrs May goes, as she inevitably will, there is no one waiting in the wings of British politics who can save the day. The pretenders for power in the Tory party – Mr Gove, David Davis, Boris Johnson and Sajid Javid – are a collection of rogues, hypocrites, bluffers and duffers. Meanwhile, the Labour Party, ostensibly in parliament to provide opposition, has covered itself in ignominy throughout this Brexit debacle with delusional leader Jeremy Corbyn still insisting he can negotiate a better deal, in which the backstop is jettisoned, before March 29. Brexit was supposed to return Britain to its former glory days of empire, but instead the country now resembles Lord of the Flies. The Irish Government, while it can remain hopeful of some kind of miracle occurring that will salvage Mrs May’s deal, must now face the fact that a no-deal Brexit is looming large on the horizon. The UK crashing out is a disaster for Ireland. While Foreign Minister Simon Coveney said yesterday the Government is “actively preparing” for a no-deal scenario, he was very vague on the details. Other than fast-tracking the recruitment of some new customs officials, he had almost nothing to say. Last week, Tory MP Priti Patel was monstered for suggesting the UK should use the spectre of food shortages in Ireland to its own advantage in the negotiations. While her comments were tone deaf and cynical, her contention – that Ireland’s economy would face huge problems if the UK exits without a deal – was not wrong. In 2017, more than 80pc of Ireland’s EU freight trade used the UK as a land bridge – amounting to 475,925 containers on lorries or trailers. While 60pc of this number remained in the UK, 40pc was destined for countries all over Europe. A report published last month stated that without access to this crucial land bridge, travel time for trade between Dublin and France would double to 40 hours for roll-on, roll-off services, and triple to 60 hours for services which lift goods on board. It’s not just trade in perishable goods that would be affected if access to this artery is cut off. In total, more than €100bn in trade could be hit. What is the Irish Government doing to mitigate the effects of a no-deal calamity on these trade routes? What alternative arrangements are being put in place to try to lessen the impact of ports in the UK being effectively blockaded? A report, commissioned by the UK government, has suggested Ireland’s economy could fare even worse than their own if Britain exits the UK with no deal. According to that study, Ireland could see a drop in GDP of up to 7pc while the UK’s would fall by up to 5pc. A decline in economic activity of that level would be ruinous for this country and this catastrophe could, potentially, begin to unfold in just over three months’ time. It’s not just trade that we have to worry about. What about those in Border counties who, depending on their location, are routinely taken to hospitals across the Border if they suffer a medical emergency? What will the impact of a no-deal Brexit be on their treatment? What should those who travel daily across the Border, for work and to see family, expect after March 29 if no transitional arrangement is in place? These are important questions that need careful consideration before answers can be provided; the Government is rapidly running out of time in which to do this. None of us wishes to see a chaotic Brexit in which the UK crashes out of the EU with no deal in place to cushion the blow. But, at this late stage, every day that passes without a deal being agreed increases the likelihood of this nuclear option occurring. If it does, we will need more than a few extra customs officials to protect us from the resulting mushroom cloud.